How To Store Bunches Of Keys? The most secure way to store keys is in a lockable key cabinet or key safe. There are many different models on the market, from basic mild steel cabinets that present a deterrent to casual thieves, to high-end models with reinforced walls and electronic locks. What is the most suitable for me, you may ask? Many key safes are too shallow to easily accommodate bunches of keys, especially if they include larger Chubb-style keys. For those needing to store many bunches of keys – vehicle hire firms, property managers or estate agents, for example – a deep key cabinet may be required. It can be useful to fit an outdoor key safe to a property or vehicle to allow access when a key holder can’t be on site. Most outdoor key safes are rather small, designed for one or two flat Yale-type keys. You can find deeper safes that will accommodate a larger bunch of keys; these tend to cost slightly more. 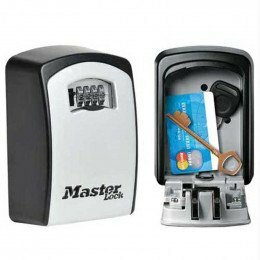 One example is the Master Lock 5403 Large Key Safe, which has internal dimensions of 146 x 106 x 52 millimetres. It is available for just under £40. 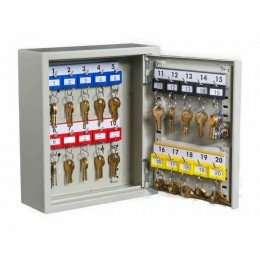 For several bunches of keys, you will need a securely locking key cabinet. 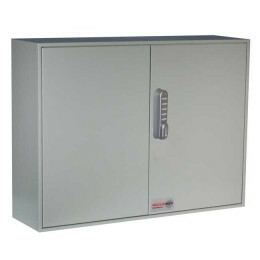 If the cabinet is to be inside a secure building, one where only staff members are likely to come and go, it is acceptable to use a basic steel cabinet with a standard keyed lock. If the cabinet is located in a public area or if the building itself is less than completely secure (for example, a site office in a portable cabin), look for a cabinet with better security. Ideally, you should try to find a slam-door cabinet. These are designed to close themselves automatically, removing any risk that the door will accidentally be left open. As before, the cost of the cabinet will depend on the dimensions. The Key Secure KS20 Key Cabinet 20 keys Electronic Cam Lock is a deep key cabinet with an electronic combination lock; it costs under £100 and allows you to store up to 20 bunches of keys inside. For larger numbers of bunches, you can find key cabinets that offer an organising system to help find exactly the keys you need. If you have upwards of a hundred bunches of keys to keep track of, the Securikey Securikey Wall Key Cabinet 500 Hooks Electronic has 500 colour-coded and numbered hooks to facilitate organisation and retrieval. This model costs around £780, depending on the seller. It is equipped with a secure cam lock, which provides good protection against break-ins but which does mean you have a physical key to keep track of. Typically, it is hard to find cabinets with more than 400 or so hooks. If you need to store more bunches of keys than this, you will need to purchase additional cabinets. It is highly inadvisable to situate large numbers of keys outside. If you must do so, consider siting the cabinet inside a shed or other lockable unit. This will provide additional security and protect both the cabinet and the keys inside from the effects of the elements. How Much Do Mobile Car Keysafes Cost?